Kitchen knives haven’t ever been my main focus, I’ve made a few here and there but it really wasn’t an area that I had dialed in. This year I’ve been trying to change that. Whenever I have time that isn’t taken up with commissions I have started working on kitchen cutlery. It’s cool to see just how thin you can get a blade while still maintaining it’s edge. 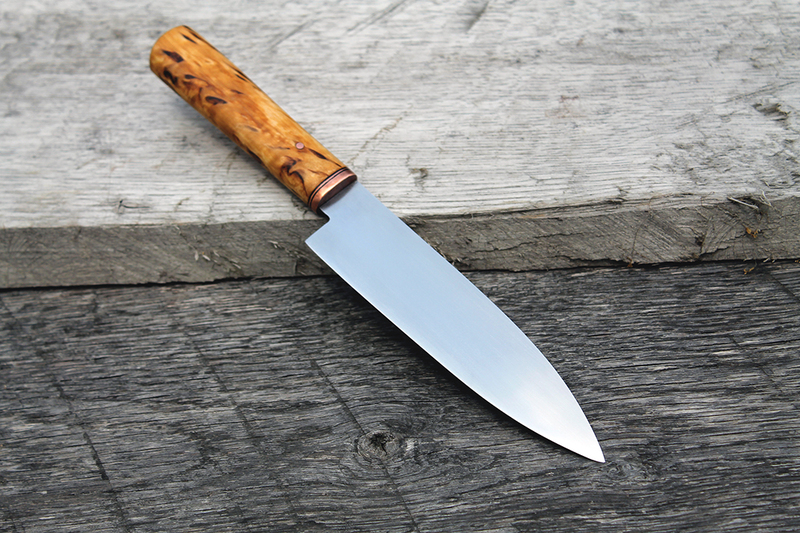 Super thin, hard knives are an excellent test for your heat treating skills. There is always room for improvement, but I get excited when I make a knife that is stupid thin and it holds it’s edge well. Here is a chef’s knife that I made for myself. Finally after being a bladesmith for 9 years I made the conscious decision to make a full sized chef’s knife for home. 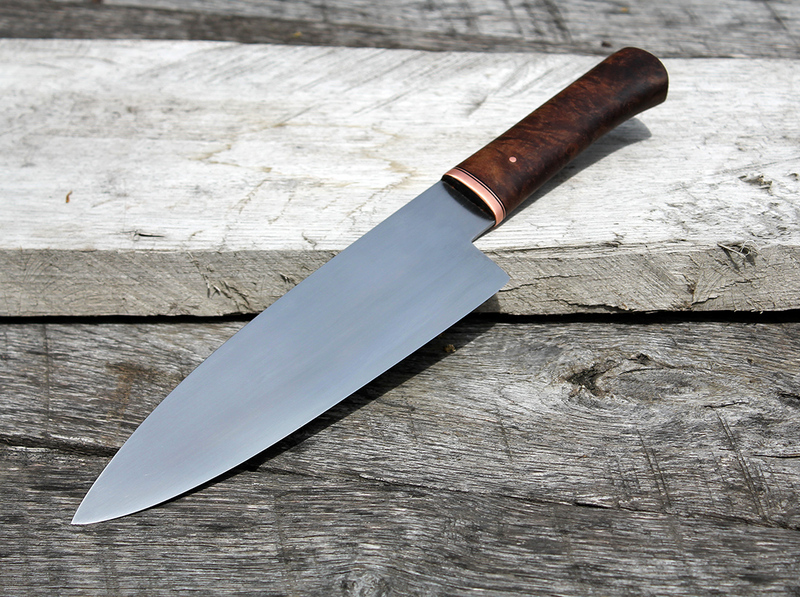 This has a 1095 blade with a Claro Walnut handle. The blade has a sturdy spine, but tapers down to a super thin edge. The next two are a paring knife and a petty/home chef’s knife. They both have 1095 blades and Masur Birch handles. 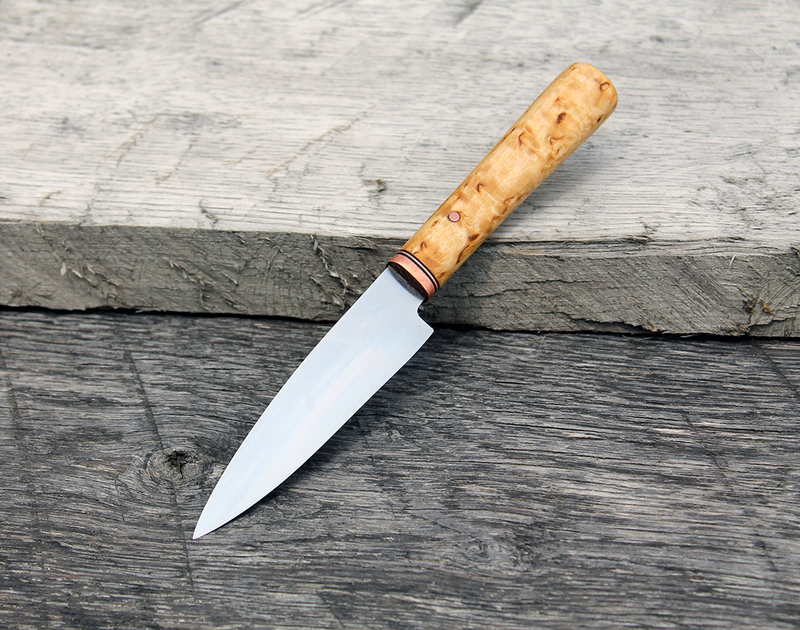 The paring knife has a 4″ blade and the petty has a 6″ blade. Both are super thin and light. These two are available for sale. Email me Nrunals@gmail.com if you are interested.